Fjorn Scandinavian: Celebrate Midsommer Scandinavian Style! Scandinavians celebrate the longest day of the year with a festival of light, flowers, food, music and dancing. This year, in Sweden Midsommer is celebrated on June 19th and 20th, in Finland it's June 20th and in Denmark and Norway it is celebrated on June 23rd. Are you prepared for your Midsommer celebrations? The summer solstice has long been considered a good time to look to the future, so get ready for the holiday (and the rest of summer) with gorgeous wood outdoor furniture from Skagerak Denmark. 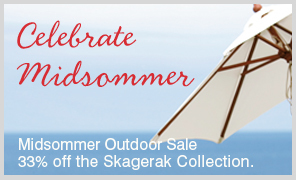 All Skagerak Denmark items are now 33% off!